The Paperlane and Witch Wool? : The very first The Paperlane Blog Candy!!! Hello lovely Paperlane friends! Hope you are all well, and still enjoying the sunshine! As the Paperlane celebrates a month of firsts - the shop's first birthday, the new blog and the new facebook page - we wanted to welcome you all by offering a very special first...... the Paperlane's very first BLOG CANDY!! As you know, The Paperlane is a very proud stockist of Molly Blooms Stamps, so the first ever Blog Candy had to feature stamps from the brand new Spring and Summer 2011 collection! Not only does it have three of these stamps, but there is a Kaisercraft 'Tea at Elsies' 6x6 pad, ribbons, Glossy Accents, Card Candi and buttons! This has all been packaged up, ready for the lucky winner! So, what do you need to do to win this lovely candy? Just leave us a comment below. We love reading them! If you fancy, join us as a follower - that's if you would like to be kept updated with all that is going on in store, ideas and projects, what's due in soon, and what has just arrived! Also share the news about our Blog Candy if you can! The more that join in - the merrier! Remember, you can also join the Paperlane on Facebook! The blog candy will run for three weeks, and the winner will be selected using a random number generator on the comments posted. The closing date for comments will be midnight on the 15th of May. love new blog it looks great. added to my favs so will be comming back soon. The new blog is great! I`ve visited your lovely shop a few times and always felt very welcome. I love the range of stamps and being able to see the beautiful card examples on display always gives me inspiration. I started card making after visiting your shop for the first time and have never looked back! I am always made to feel welcome and leave full of inspiration and ideas. I get more and more enthusiastic after each visit. Great blog have become a follower, would love to win. Have added a picture to my sidebar. Followed the link from Clare's blog 'Molly Blooms', love the blog and will add to favorites. I am a follower now and here is my comment! What a lovely idea everyone likes to think they will be lucky enough to win such lovely goodies. This would get me started. 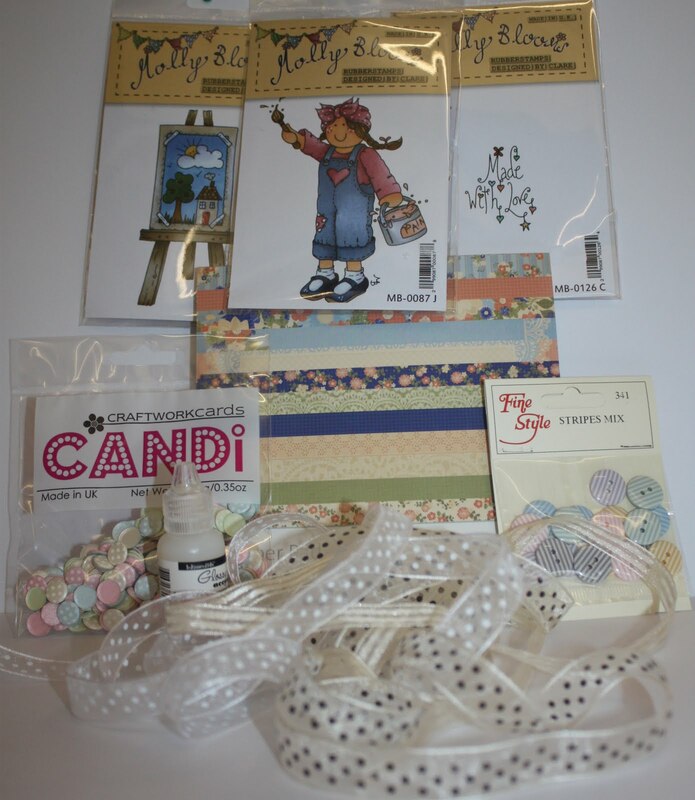 Just come from Clare's blog,love Molly Blooms,thanks for the opportunity to win some great blog candy. Joined you as a follower the other day and am waiting anxiously to know if you can squeeze me into the class on the 11th - saw Clare last week at Embsay - what an inspirationl lady with the most gorgeous eye for colour - would love to win the candy especially as I know my Molly Blooms collection is going to grow! 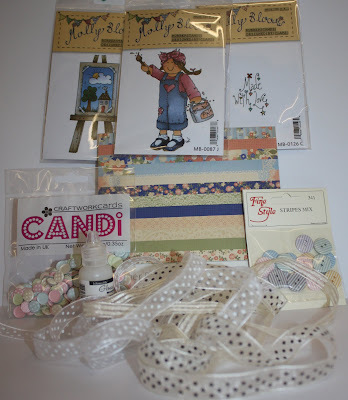 Love the blog and thanks for a chance of winning your fab blog candy !! Thanks for the chance at these goodies! Good luck with your new blog and the store.